So, if I said baked oatmeal, what would you say? You know, I probably would have said the same thing at one point but then I actually tried baked oatmeal and let me tell you, it rocked my world! 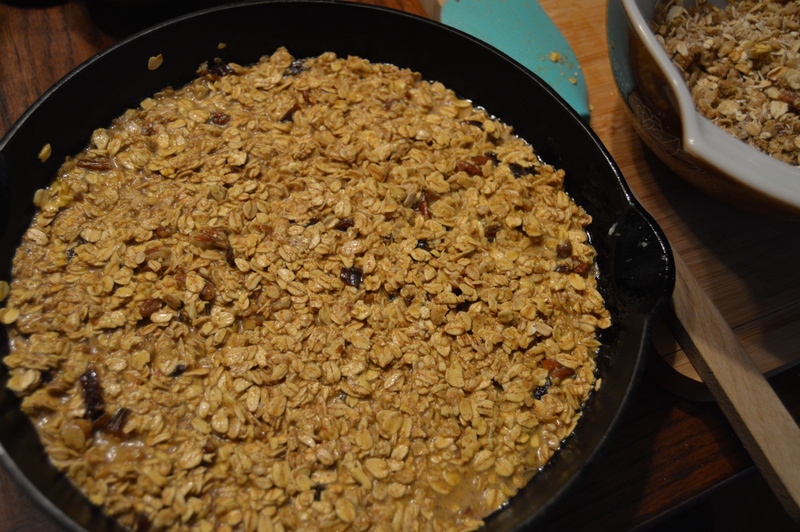 Baked oatmeal is nothing like it’s cooked-on-the-stovetop counterpart. Oh, no. 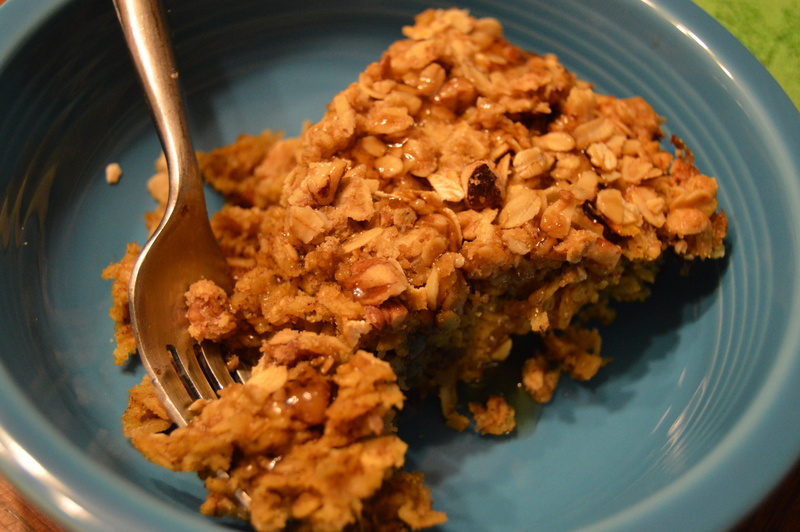 Baked oatmeal is firm and cake-like and filled with cinnamon and nuts. 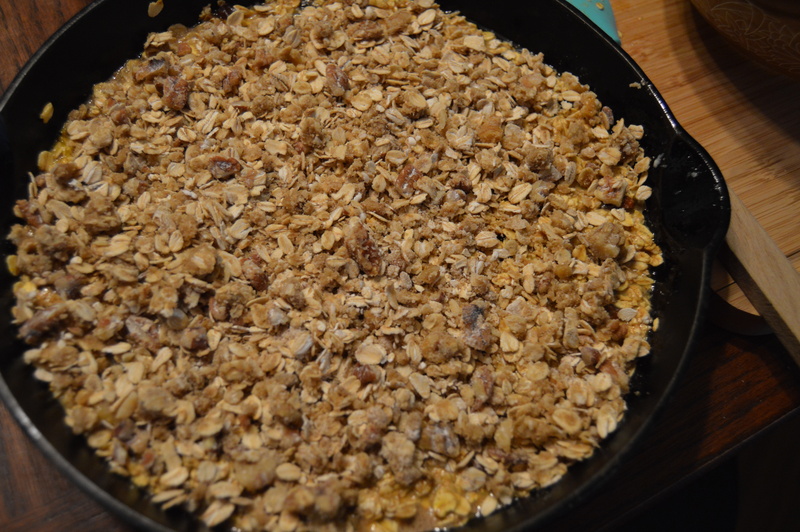 Baked oatmeal could just turn your mornings upside down! I’m serious. 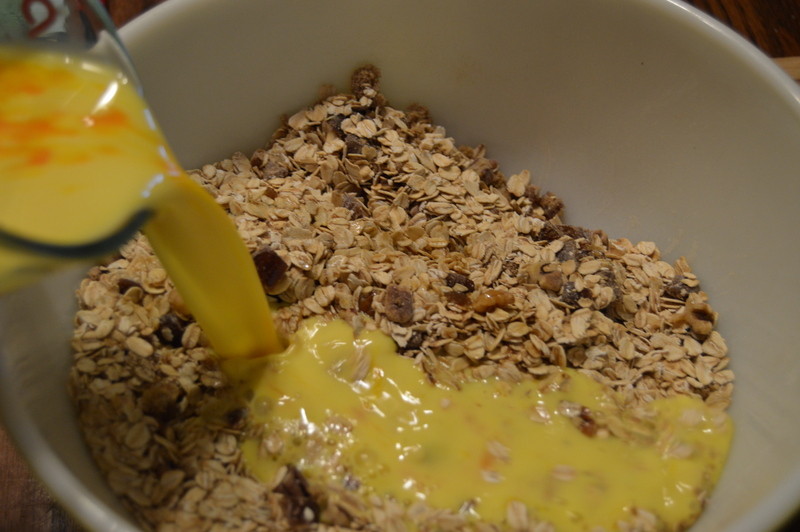 I am NOT a fan of gloppy, gooey, oatmeal that will congeal if it sits long enough. Can you say eeew? This is a breakfast your family would be happy to sit down to on Easter morning. You can serve it on its own or if throw in some bacon and scrambled eggs on the side. 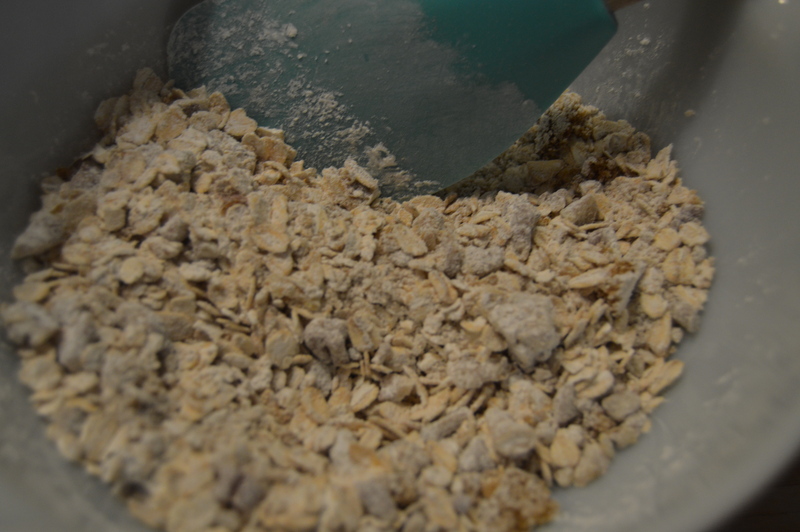 This is a hearty enough oatmeal to keep your belly full until it’s time for Easter lunch. So go on, try something new this Easter! You won’t regret it! Add some butter to a skillet and pop it in the oven to melt. Keep an eye on it and take it out when it’s completely melted but not yet browned. Chop your nuts. I like mine a little more chunky. 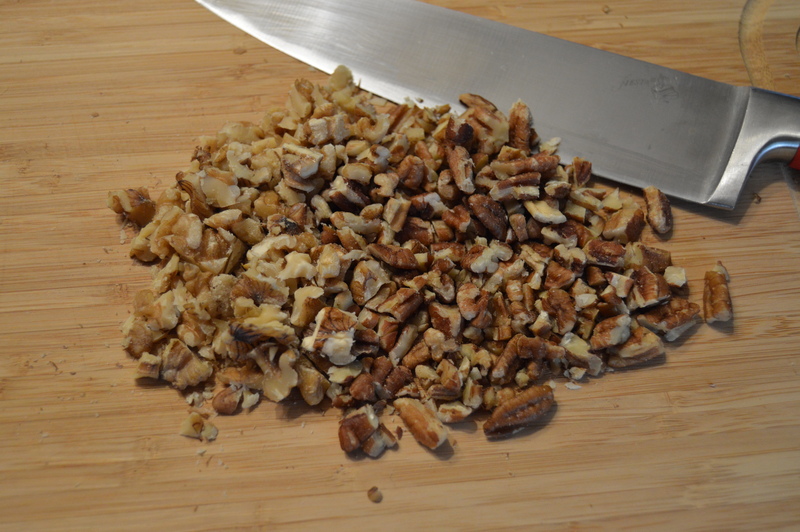 I’m using walnuts and pecans. What can I say? I like variety. Dice your dates. 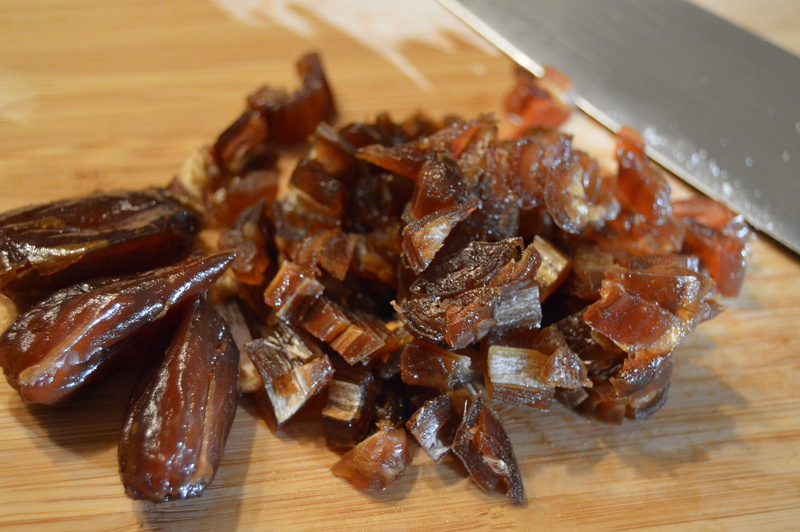 If you haven’t diced a date before, beware: they’re sticky!!! 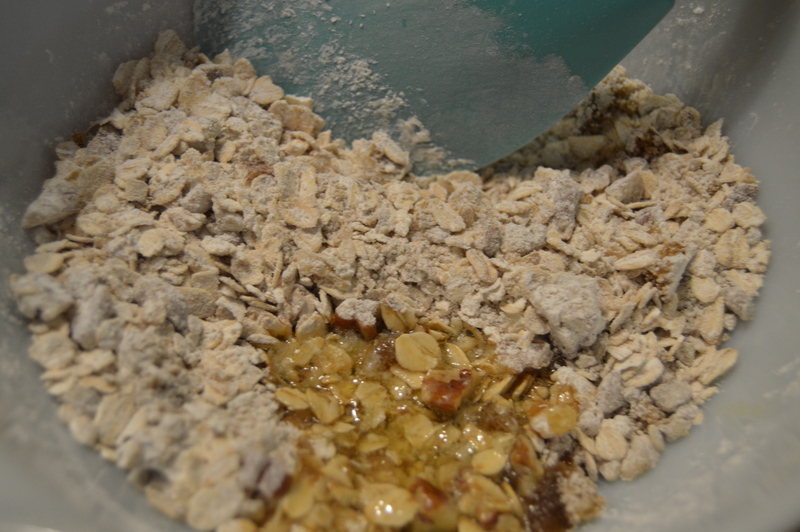 To a small bowl, add the 1/2 cup oats, 1/4 chopped nuts, 2 tablespoons brown sugar and the cornstarch. Then add two tablespoons of the melted butter from the skillet. Stir it around until there isn’t any dry mixture left. Set this to the side. We’ll use it in a bit. 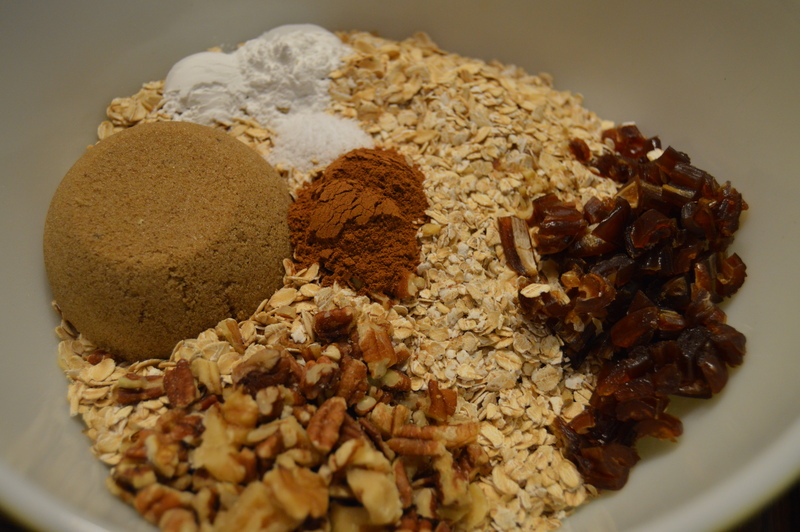 To a large bowl, add remaining oats, brown sugar, baking powder, salt, cinnamon, nuts and dates. That’s a lot of stuff. Did I forget anything? I hope not! 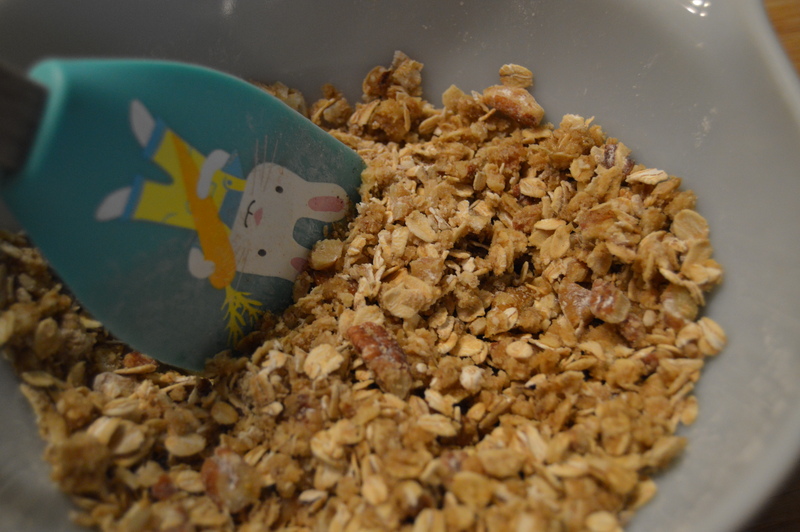 Stir this mixture up too and make sure you break up any date or brown sugar clumps that are lurking amongst the oats! 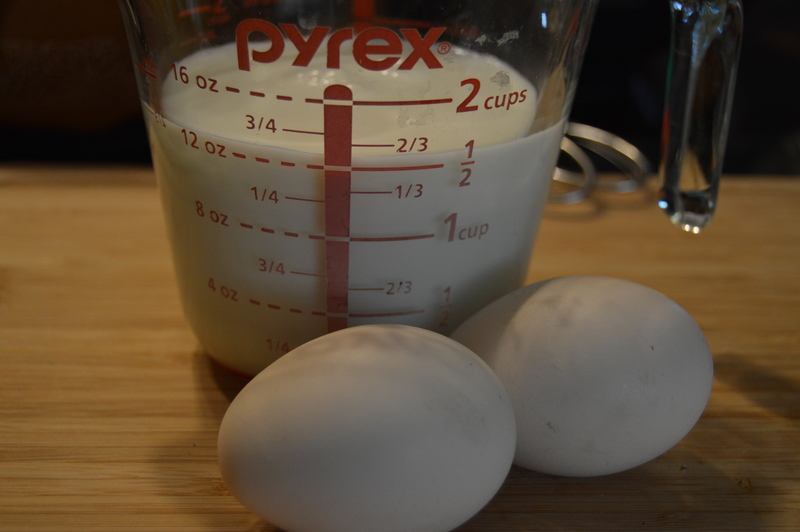 Whisk together milk and 2 eggs! Pour in that delicious melted butter! Don’t scrape it all out of your skillet, though. I know it’s tempting to use every drop but you want what’s left to grease your skillet! It will be very wet and may look kinda funny, but I promise you that’s normal! You want all that liquid so it can soak into the oaks and make them nice and soft! Pour it in your prepared skillet and smooth it out on top! Now add the prepared crumble to the top and smooth it around pretty evenly. Pop it in your oven and bake for 30-35 minutes; the edges should be starting to brown. Beware of cooking it too long because then it may be dry. Watch it closely toward the end! When you pull it from the oven it will smell divine! Allow it to cool just a bit before slicing it into wedges. Slice it into wedges and serve with a drizzle of maple syrup or be creative and choose your own way to serve it! Don’t forget to enjoy! Preheat oven to 350 degrees. 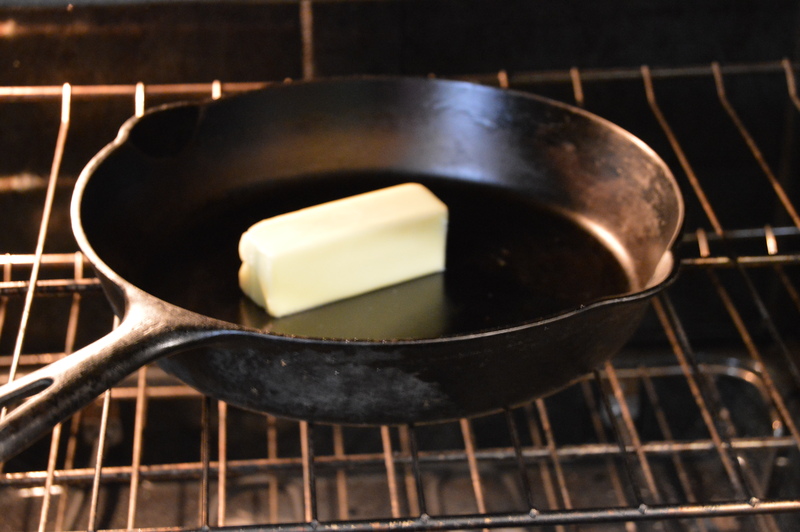 Add butter to 10 1/2″ cast iron skillet OR deep dish pie plate. Place in oven until melted, but not browned, then remove from oven and set aside. 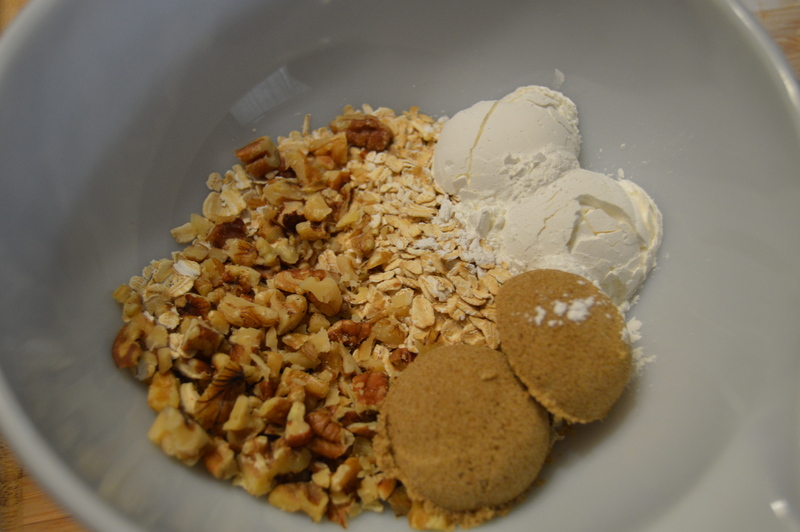 While butter melts, roughly chop the nuts and dates. 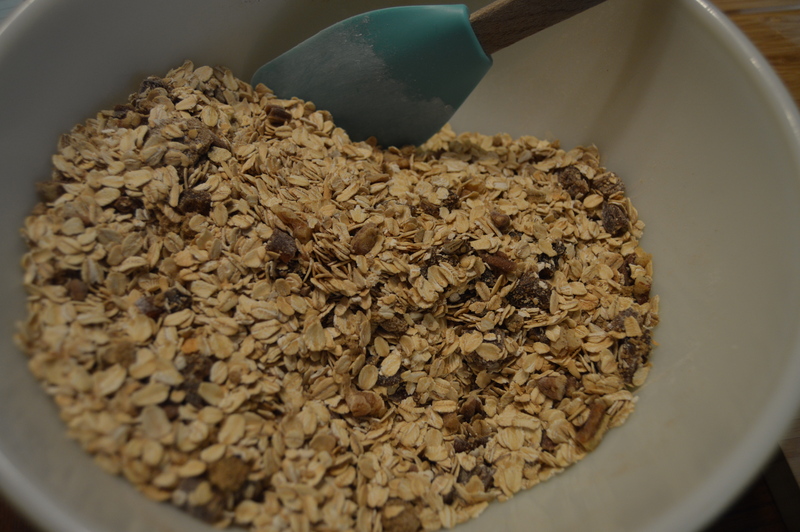 Add 3 1/2 cups of oats to a large bowl and 1/2 cup oats to small bowl. Divide nuts between the two bowls, adding just slightly more to the larger bowl. Measure out 1/2 cup brown sugar for large bowl and 2 tablespoons of brown sugar for small bowl. To the small bowl add the cornstarch and 2 tablespoons of the melted butter. Give it a good stir until the butter is well incorporated then set aside. To the large bowl, add the dates, baking powder, cinnamon and salt. 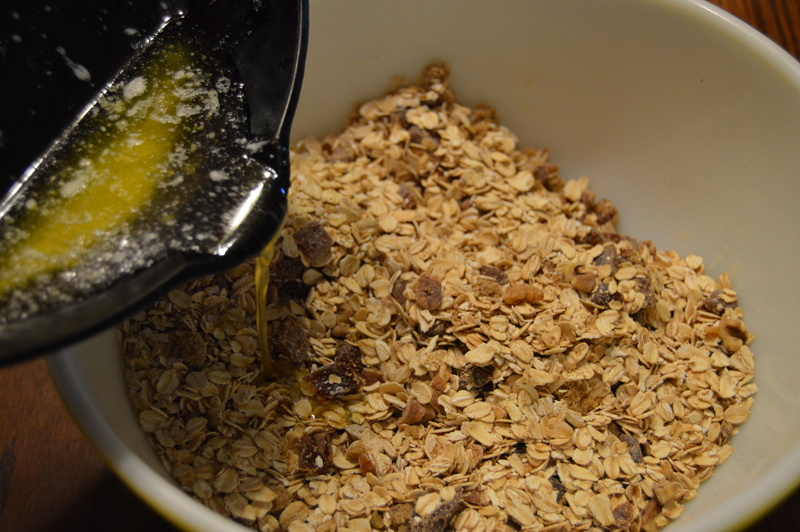 Stir the mixture until everything is evenly distributed making sure you break up any date or brown sugar clumps. Add the rest of the butter from the skillet and the egg mixture and stir it well. It will be very liquid but that’s okay because the oats will soak it all up! 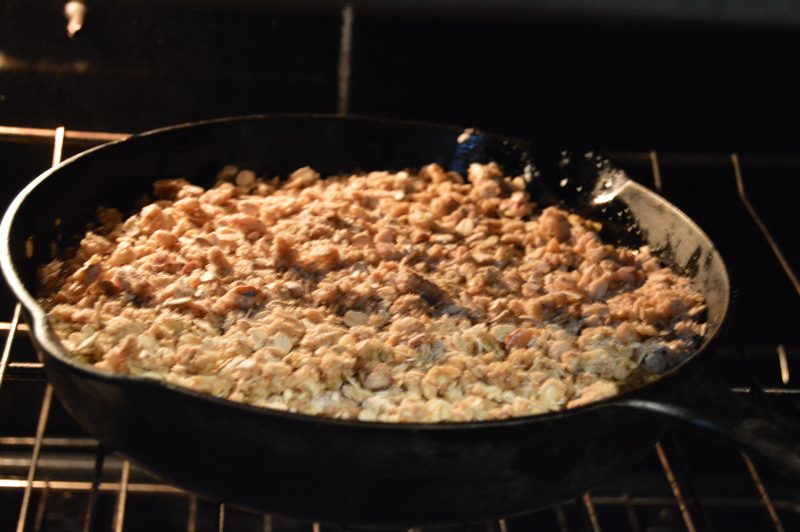 Pour the mixture back into your skillet and smooth it out on top. 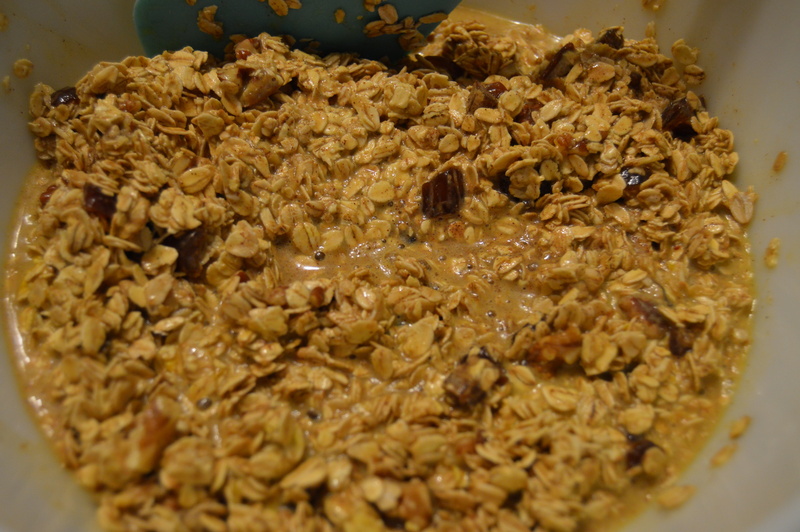 Add the oat/nut mixture from the small bowl and spread it around as evenly as you can. Bake for 30-35 minutes or until edges turn golden brown. Cool slightly before cutting into wedges and serving. Serves 8-10. Notes: Once you dish it up you can do so many things! Serve it with yogurt on the side, drizzle it with maple syrup, add a small splash of heavy cream (if you’re feeling decadent) or if you prefer a more traditional style oatmeal, add some milk and give it a stir. This recipe can easily be adjusted to suit your preferences. Instead of cinnamon, try some nutmeg. Substitute dried cranberries and almonds for the dates, pecans and walnuts. More sugar, less sugar, white sugar, no problem. The sky is the limit here people! Don’t let your oatmeal be boring. Experiment! Create! This recipe is heavily adapted from this one on thekitchn.com. Happy Easter my friends and until next time, keep baking!